Is Poor Posture Causing Your Shoulder Impingement Syndrome? Shoulder impingement syndrome is one of the most common problems that we see in clinical practice. Shoulder pain can be tough to resolve, largely because the shoulder itself is a highly mobile joint that requires complex muscular activity to stabilise it. This means that it can be a challenge to find and correct the real source of the problem(s) which are often multifactorial and hidden away from the area that hurts. Recent research has linked poor posture to an increased risk of shoulder pain, particularly impingement syndromes and in this post I will examine the real reasons behind why this happens as well as the best solutions for shoulder pain. Where Is My Shoulder Pain Coming From? There are many different tissues around the joint which can become painful, as well as a great many different possibilities for why they can go wrong in the first place. The joint itself, as well as bursas, tendons, cartilage, labrum, tendons, ligaments, ribs, nerves and collar bone joints, can all become painfully dysfunctional. In a recent blog post, I touch upon the complexity of the shoulder and why it is often so hard for patients to find a lasting cure for their shoulder pain. In this post I am going to focus on the inter-relationship between three of the main players in the shoulder; The rotator cuff muscles, the subacromial bursa and how they are influenced by poor posture resulting in impingement syndrome and chronic shoulder pain. There are many ways that the rotator cuff muscles (infraspinatus, tires minor, supraspinatus and subscapularis) can become painful; ranging from impingement to tendonitis and tears. An injury to the shoulder that results in a partial tear can often be managed conservatively with chiropractic care, rehabilitation and time to rest and heal, but a complete tear (grade 3) may require surgery to resolve. Impingement of the rotator cuff tendons is a very different problem that can be resolved with conservative focusing upon the whole structure. This is where posture becomes very important and the reason why becomes self-evident when you understand some basic anatomy. 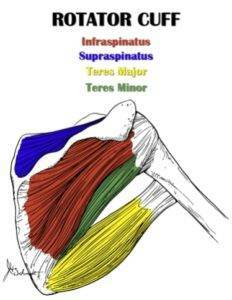 The supraspinatus muscle runs through a small space at the top of the shoulder bone known as the sub acromial space. Your posture can influence this area because if your shoulders become rounded the sub acromial space narrows leaving less room for the muscular tendon to pass. Over time, as your move your arm this tendon can get pinched, squeezed and impinged, especially if overhead lifting is involved. This is why weight lifters and manual workers who do a lot of over head work, such as plastering or painting are often good candidates for shoulder pain. If the alignment of the joint itself is not corrected then chronic inflammation and pain can result. It is no surprise to learn then, that the two most common sources of shoulder pain are the supraspinatus tendon and the subacromial bursa, which live within this sub acromial space. Stand up, let your shoulder relax, raise your straight arm out to the side about 45 degrees, turn your thumb downwards to point to the floor and keeping your arm in that same internally rotated position raise it up further towards the ceiling as far as it will go. If you feel a pinching, pain or discomfort in the front of the shoulder, then you may have an impingement syndrome or an inflamed supraspinatus tendon that is heading towards an impingement syndrome in the future. Another useful ‘self-diagnostic’ test is to check your shoulder position. Once again stand up with your arms by your sides and then simply breathe in, breathe out and your body slump and relax. You can even get someone to take a picture or video of you from the side so that you can see your shoulder positioning. If your shoulder rolls in (internally rotates), then you have the type of rounded shoulder posture that will predispose you to shoulder pain. There are lots of exercises that you could look at to help address the postural distortions and muscular weaknesses that lead to a shoulder impingement. This video shows you three very straightforward and easy to follow moves that make a big difference for many patients suffering from shoulder impingement syndrome. There are many different treatments available for shoulder pain, some more effective than others. I certainly recommend an approach that involves a functional assessment of all of the shoulder muscles (such as applied kinesiology, which is the gold standard in functional strength assessment), because restoring strength to weakened muscles is foundational to solving the problems. A functional assessment will reveal which muscles are weak and what needs to be done to correct them. This can get complicated because it is not always a case of strengthening weak muscles with exercises. Very often there is a requirement for nutrient supplementation, dietary change, hormonal balancing, spinal and extremity adjusting as well as craniosacral therapy. It is important to remember that regardless of the form of treatment that is chosen, long term success rates are lowered if the underlying poor posture remains uncorrected. Even if shoulder position is addressed by prescribing exercises that strengthen the shoulder, results in my experience can be frustratingly slow for patients. The shoulder does not work independently of the rest of the body, so if you focus purely on the shoulder and neglect full body alignment, you may never achieve true balance. Real posture correction needs to take into account the entire frame of the body and not just the shoulders by themselves. The upper back and shoulders may be rounded because there is a deeper imbalance in the feet and the lower back which will cause the shoulder problem to either not resolve or to come back again. A chiropractic technique known as Advanced Biostructural Correction, ABC works by addressing the whole body, specifically the bones which go out of alignment in directions which the body cannot self-correct, as there are no muscles pulling in the direction needed to do so. When the ABC technique is expertly applied, we expect dramatic and lasting improvements in posture. These improvements include restoring normal shoulder alignment and an opening up of the subacromial space that takes the pressure off of the subacromial bursa and the supraspinatus tendons, allowing healing and recovery to take place. There is a lot that can be done with home exercises to help your upper back and shoulder postural fitness. One of the best exercises to work on is the Wall Angel as demonstrated in the video below. If you cannot get your arms up to the required height because of pain then you may require a visit to a chiropractor to help you get started. Some professionals like to claim that posture can be corrected through correctional exercises, but this is simply not accurate. While it is true that you can improve postural fitness and your ability to maintain strength against gravity, you cannot correct the actual causes of poor posture with exercises, stretching or body movements alone. Real correction requires that the alignment of the bones themselves addressed. Ideally, both postural fitness and structural correction are worked on together to provide the ultimate lasting solution to body structure problems like shoulder impingement pain. The true cause of rounded shoulders is a misalignment of the first rib bones. At the time of writing this post, you are unlikely to find any high quality published research that proves this theory, but you will find hundreds of pre and post posture pictures in the office of any chiropractor who practices Advanced Biostructural Correction that does. Personally, in my professional practice, I have yet to see a single case of rounding shoulders that did not immediately return to the proper alignment after a correctly applied first rib manoeuvre. Here is a great video that demonstrates how this highly effective first rib manoeuvre works. If you or someone you know has been suffering from chronic shoulder pain and impingement syndrome, then ABC technique and true structural correction may be the solution that you have been searching for. Now it’s your turn. Have you been suffering from shoulder pain? If so for how long and what have you tried to fix it? Have you addressed your posture as part of an overall approach to full body health? What were your results with that? Place your comments in the box below; we would love to hear from you! I have rotator cuff impingment on both sides. Physio gave me similar excercises as you do. I’m not sure if I should be doing them just to the point where the pain begins, and it is painfull or further through into the pain zone. Some practioners recommend not giving yourself more pain but just to stretch to a piont where the pain starts. Am I causing more damage stretching into the pain zone?